Women prowl through the floors like predators, watching, waiting for the perfect kill. Potential prey is everywhere, just waiting to be pounced upon. They watch each other suspiciously, silently comparing kills. It is the last day of the big sale at Myer, and no one is safe. 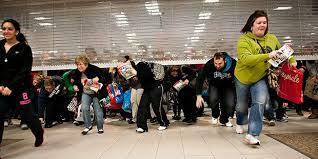 Shopping in a department store during a big sale is like guerilla warfare. Now don't get me wrong, I know war is a hell of a lot tougher and actually deadly, and I mean no disrespect to the men and women of the armed forces. However, if you look closely, there are a lot of similarities. As I stood in the middle of the Myer women's department, these were the thoughts that were running through my mind. The racks of clothing were full to bursting, this season's looks all put out to pasture to sell as quickly as possible. The ladies know this is their last chance to grab that dress, those shoes, this bag they have been lusting after for months, at a discount, before they're all gone. Each person has a handful of items, greedily perusing the racks and giving each other sidelong glances to see if someone else has got a better item than them. At the counters they barter, trying to get the prices down further. The line to the change rooms is ten deep at any moment, the sales assistants frantically trying to keep up with the demand. I myself am desperate. I need a dress for a party the next evening, and I have been trolling the shopping centre for hours. Finally, I arrive at my final destination, Myer, hoping against hope that there is something there that will fit, something unique, something that will make me look amazing. I wander through the racks for a while, observing my fellow comrades in battle. It has been a long day for us all, and it looks like everyone has hit a wall. Mothers are screaming at their daughters, salespeople are tearing their hair out, and cash registers are going off like artillery fire. There is no natural light; many of us have not seen daylight for hours on end. The terribly elevator music playing overheard becomes our marching rhythm, invariably leading our credit cards to doom. I have exactly $213 in my bank account, and I need to find something to spend my last measly dollars on. I, as I assume many other soldiers here do too, have a variety of suitable options already in my wardrobe at home. But I cant resist the allure of something new, and a sale means a bargain, right? I'm saving money, practically making money, right? It would be a crime not to buy something. Me and another woman are perusing the same rack. I look down and eye some sequins. I gasp, and my eyes widen as I look up and alight my eyes on a beautiful dress, the perfect little cocktail option for the party I am to attend. There is only one. My face falls. I dare not even look at the size and price, but I cant look away. I reach down the dress and pull out the tag. It's $178. Do-able. It's size 12. I might squeeze in to it if I break a rib (Also do-able). I take a chance and grab the garment, virtually shove everyone else out of my way and make a beeline for the change rooms, zig-zagging and rolling through the debris to reach my target. I join the end of the line, evil-eyeing anyone who dare push in front of me. I have about five people before me, and my heart sinks to see the amount of hangers in their arms. I'm in for a long wait. I finally get into a change room and take off my clothes, trying to avoid the hostile enemy that is the three-mirrored change room accusing me of cellulite, double chins and back fat. I roll the dress on, fasten the clasp and open my eyes. It's on. The dress fits. It looks nice. Sure, it has a couple of pulls in the fabric that I can notice, but no one else will see them, right? When the change room attendant says it looks good, I know I have to have it. I undress and put on my ugly shopping clothes, protectively holding my find to me chest like a swaddled baby. I attempt to find a counter that is not too busy, and wait in line. The lady in front of me seems to be purchasing 10,000 items, and is debating the price of every one. Eventually an angel emerges, a salesperson ready to ring up my dress. I stare her down, prepared for a fight. As she scans the dress, I realise it's not on sale. I should have paid closer attention to the signs. No saving. Then she notices the pulls. Hmmmm, she says; that's no good. That's quite noticeable. I give a little laugh and think NO! You can't see them. No one can. They're my hidden secret!. But maybe I can use this to my advantage, twirling my imaginary handlebar moustache and laughing evilly in my crazy mind. She offers me 10% off. I nonchalantly accept it, not showing my relief that I will now have at least $40 to my name after this purchase. That's two $20 bills. I might be alright after all. My lovely angel puts through my purchase and minutes later I am escaping this harsh environment, gasping for air as I leave the trenches and escape in to daylight, albeit muted in the concrete parking lot. I vow never to return to this environment, this land that has broken my spirit and taken everything I have. As I walk to my car I notice a well dressed woman strolling through the automatic doors, her rifle, I mean handbag, slung over her shoulder. Hmmm, I wonder where she got those jeans! I spin on my heel and walk right back in to hell.